Pitch Decks/Slide Decks: Our professionally prepared and designed business plan pitch decks are specially crafted to wow from the first slide. The ideal pitch deck exposes a need and shows how a client’s concept can fill that need. We help clients back up this point with solid market research. The company’s staff of professional designers, who have experience in everything from journalistic design to technical illustration, add visual impact without getting in the way of the information, supplementing hard facts with eye-catching visuals. Looking for a different kind of presentation? Contact us today with all your presentation needs, and let us work out a solution that exceeds your expectations. 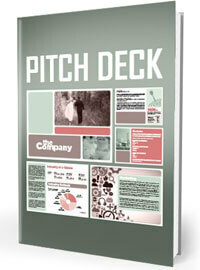 Prerequisite: A comprehensive business plan is required to develop the Pitch Deck.